1. Elizabeth Rose PARR was born circa 1808 in Liverpool, Lancashire. 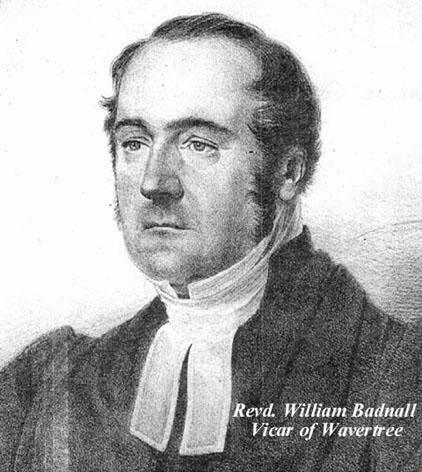 She married William BADNALL on 16 July 1833 in Childwall, Lancashire. She died circa 1883 in Leek, Staffs.. This is the last Will of me Elizabeth Rose Badnall of Endon in the county of Stafford Widow made in exercise of every power and also independently of any power I appoint devise and bequeath al the real and personal estate over which I have any power of disposition unto my nephew William Beaumont Badnall Esquire and Mr William Saddington Watson of Leek Silk Manufacturer absolutely and in fee (whom I appoint to be my Executors) with power to sell or convert any real estate Upon trust as to all my estate for my three surviving children namely William Wykeham Badnall, James Badnall and Arthur Robert Badnall equally.. And I direct so far as I legally can or may that the share off each of my said three children shall belong to him for life or until by any act of his or by operation of law all or any of the income of such share or any part thereof as would but for this clause become vested in any other person or persons after his death or the sooner determination of his estate Upon trust for such of his children as shall be born in my lifetime and attain twenty one years of age or sooner marry And I direct further not withstanding the foregoing that as regards the share of my son James Badnall the whole of my Estate over which I have power of absolute disposition shall so far as it will extend or be necessary be appropriated and applied towards such share and that the income of such estate so appropriated shall be paid to his wife Ellen for life for her separate use and without power of anticipation and not withstanding that my son James may be living And I expressly direct that As regards the original one third share so given as hereinbefore mentioned to my son William Wykeham Badnall he or his children or child shall not be entitled to all or any part thereof until the sum of seven hundred pounds which was sometime since advanced by me to him shall be brought into hotchpot by him or his children or child and accounted for And further I declare so far as I can or lawfully may, that as regards the original one third share so given as hereinbefore mentioned to my son James Badnall or so much thereof as I can make subject to this stipulation he or his wife or children or child or other the person or persons who would take shall not be entitled to all or any part thereof until the moneys which my Estate may be liable to pay be reason of my several undertakings of this date to Mr Robert Cleminson and the executors of my late daughter Mary Elizabeth shall be brought into hotchpot by him my said son James Badnall or his wife or children or child or other person or persons who would take and accounted for I empower my Trustees or Trustee for the time being to advance to or for the benefit of any grandchild of mine not withstanding that his or her father may be alive but with the consent in writing of such father if living all or any part of such child's reversionary or contingent or expectant share And to advance to any of my sons not exceeding altogether one third of the principal share to which such child may be entitled for life in possession but it is my particular wish that no such advance to a son shall be made unless my trustees or trustee shall be of opinion that it is likely to be of permanent advantage to such son. Elizabeth Rose [her mark] Badnall - Signed by the testatrix Elizabeth Rose Badnall and declared by her to be her Will in the presence of us both being present at the same time who thereupon in her and each others presence hereto subscribe our names as witnesses the interlineations between the 16th and 17th and the 26th and 27th lines of the first page having been first made and she the testatrix having declared that she had read over and perfectly understood this will in our presence Margaret Elizabeth Watson, St. Edward Street, Leek, J Challinor, solicitor, Leek. On the 10th day of January 1884 Probate of this Will was granted to William Beaumont Badnall Esquire and William Saddington Watson the Executors. General Probate Registry : Office Copy of the Will of Elizabeth Rose Badnall of Endon 1884. Mary Elizabeth BADNALL (1834-1880). Mary was born on 12 August 1834. She married Edward CHALLINOR on 8 June 1854. She died in November 1880 in Fenton Lodge, Stoke on Trent. She was buried on 9 November 1880 in St. Peter ad Vincula, Stoke on Trent..
William Wykeham BADNALL (c. 1836-1911). William was christened circa 1835 in Wavertree, Lancashire. He was baptised circa 1835 in Wavertree. He was born circa 1836 in Wavertree. He died on 24 August 1911 in 1 Olive Vale, Wavertree, Lancashire. He was buried in 1911. James BADNALL (1839-1897). James was born in 1839 in Wavertree. He was christened on 24 September 1839 in Wavertree. He was baptised on 24 September 1839 in Wavertree. He was a Vicar of Endon, Staffs. He was educated at Royal Institute School, Liverpool, University of Durham. He was Church of England. He died on 19 October 1897 in Endon, Leek, Staffs.. He was buried in 1897 in Endon. Harriett Martha BADNALL (c. 1840-1881). Harriett was born circa 1840. She married Thomas HORNBY in 1875. She died on 27 December 1881. She was buried in December 1881.